The key to a nice, lush green lawn is planting seeds at the correct depth to establish strong roots. The same can be said with most of America’s business owners, including James Barfield. 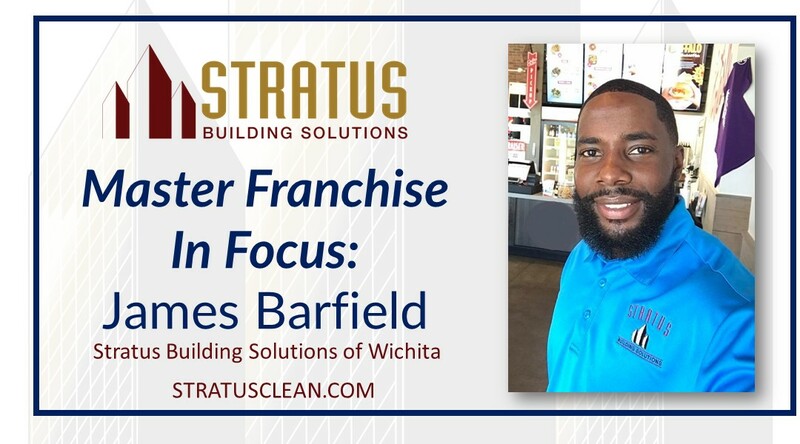 He’s the Wichita, Kansas area master franchisee for Stratus Building Solutions, the nation’s leading green commercial cleaning and janitorial services franchise. At 32, Barfield is currently Stratus Building Solutions’ youngest master franchisee in the system. Barfield’s journey is rooted in a steep family history, trials and tribulations and a tenacious never-surrender spirit. The Barfield’s entrepreneurial tree includes Theresa’s women’s clothing business. She catered to professional women over the age of 40. “My mom helped women ‘dress for success,’ – helping women get started or start over,” says Barfield. The elder James owned a computer repair sales business. The Barfield’s also had a makeup line that was featured in JC Penny. To keep his mind sharp, Barfield says he reads two to three books a month minimum. “It helps me stay on the right path,” he says. That’s no surprise. The former high school basketball and baseball player doesn’t shy away from challenges, inside or outside the lines. Like his family’s roots, his desire to succeed is strong. Are you in search of a similar business ownership experience as James Barfield? Does the Stratus Building Solutions franchise opportunity sound like it could be for you? If so, learn more at http://www.stratusclean.com/.